In App Store you will easily discover dozens of applications for managing personal finance, and all of them will help you be economical, but tr.en.d beyond that will help you be successful. and as a result: know yourself and your life better, understand your strengths and move on. 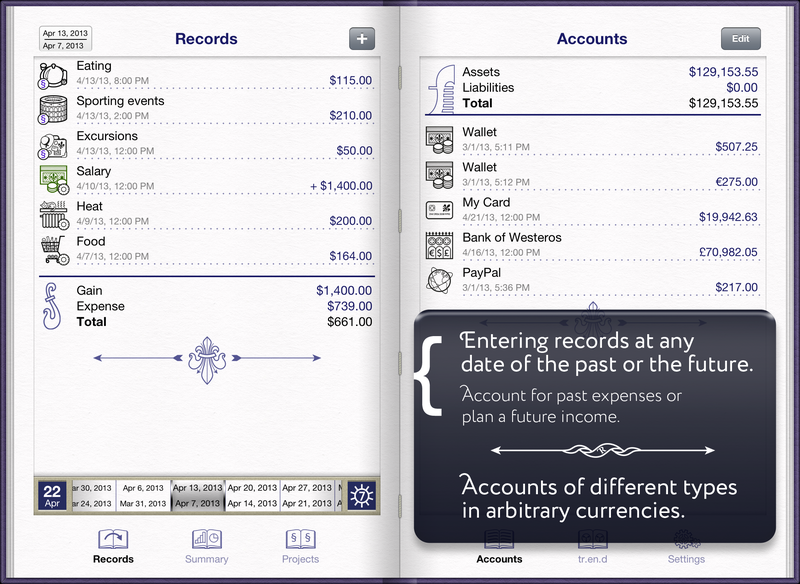 In addition, tr.en.d is a handy application for personal finance accounting. Enter financial records at any date of the past and the future without restrictions. Open accounts in different currencies. Group records into projects and monitor the finances in a separate area. With an easy set-up, create regular payments of two different types: periodic and ongoing. The application forms a convenient summary for any period: the illustrative graphs and diagrams will help you in analyzing your finances. Synchronization between devices by means of iCloud (this feature is introduced at the beta testing level).